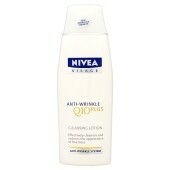 Nivea Visage Anti-Wrinkle Q10 plus. Effectively cleanses and reduces the appearance of fine lines. Nivea Visage® Anti-Wrinkle Q10 plus Cleansing Lotion now contains 100% more Coenzyme Q10. With double the strength of Q10, this mild cleansing formula is part of a high-performing anti-wrinkle system that supports the skin's energy metabolism from within to continuously fight wrinkles. Anti-Wrinkle Q10 plus Cleansing Lotion effectively removes make-up and impurities while respecting the delicate moisture balance of your skin. Thanks to precious moisturisers your skin is softly hydrated without any unpleasant greasy residue. Aqua, Glycerin, Paraffinum Liquidum, Isopropyl Palmitate, Cetearyl Alcohol, Methylpropanediol, Ubiquinone, Pimpinella Anisum Extract, Panthenol, Glyceryl Stearate SE, PEG-40 Castor Oil, Sodium Cetearyl Sulfate, Sodium Carbomer, Phenoxyethanol, Methylparaben, Propylparaben, Parfum.